LOFTwall products are designed to help individuals and organizations better utilize space with flexible and functional freestanding divider screens. 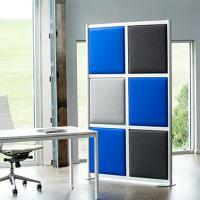 LOFTwall office dividers are built to order, featuring a wide range of sizes, customizable panels and unique finishes. The modern workspace is evolving and the need for modular yet private spaces makes LOFTwall divider panels the perfect solution for offices, healthcare facilities, hospitality and more. We offer room dividers in many different configurations and formats including our newest product, BLOX, which won NeoCon’s “Best Of, Silver Award” for 2016. Our modular frame is made from 75% recycled content and can be easily customized with panels available in a wide range of colors and finishes. LOFTwall room divider products are made in the USA at our factory in Dallas, Texas.